Heck, while I was busy taking party in the celebrations for my parent's 50th wedding anniversary Google has released the specs for the API for the Google Calendar. So, to most Google watchers this is old news. But it is exciting news anyhow. Now I need to find some time to play with it and get something useful set up with it. Can someone please slowdown Google? I can not keep up with them. I created a small post about running Apple OS X on (more or less) stanadrd PC hardware. And I wasn't the only one making that connection. With all the hoo haa about running windows on a mac, many people have forgotten about the other side to the story. What about getting Apple software to run on ordinary Intel computers? Born out of a sense of saving money (not having to buy a Mac and installing Windows XP through Boot Camp) I hoped for doing the opposite. Getting one my (older or current) PCs and flinging a legally purchased version of OS X on it using some kind of bootloader. Or run it as a virtual PC inside Windows OS X. This all would be great and fun, but I do not see it work. Apart from Steve Jobs looking very angry at me I think there will be too many hurdles to jump over. Apple's OS is so tightly linked to Apple hardware that one would need something like HAL. But it should be possible. And in fact it is! It was bound to happen sooner or later, but a coder going by the name of Maxxus has hacked Mac OS X to run on generic PCs that meet some relatively simple criteria. Of course it isn't a very polished solution yet and it does require a bit of work to even get the system booted, but it's bound to improve over time. Only problem is that it perhaps is not a legal solution where as running Boot Camp on Mac hardware is. That's why I would like the official Microsoft Boot Camp for Windows . And running Mac OS X as a Vitrual PC would just be hilarious. Is Google helping open source? .. or are good intentions stopping progress? Over the last few months Google have released many interesting products that help users and website owners around the web. The benefits of Google Maps, Google Analytics, Google Sitemaps and the freshly released Google Calendar are not too difficult to spot. The collection of APIs that came along with (some of) these is of great help for developers who want create mashups or other nice extensions. Everything seems to be great and with the APIs open source implementations get a boost. Over on use perl; rjbs is not too optimistic in his journal about the impact of the recent release of Google Calendar. He states that it hurts open source. To say that this helps free or open source software is wrong and harmful. It hurts open source by providing a shiny, proprietary alternative. This is a new view on the Google complex of applications and services. Google is open in the sense that it provides us with APIs so we can adapt the apps and services to some of our needs. The applications themselves are closed source. They carefully protect the inner works. And rightfully so. It is what they make their living with. And there is absolutely no harm in making profit. Not even the big profits like they are making. The APIs do not always complete and unlimited access to the applications and there are simply too many features left out. I think we'll see the same independently-developed extensions for Google Calendar that we've seen for Gmail: basically none. This, I fear, could be a thing that works against Google. The lack of support for open source and truly open APIs that cover all functionality can cause a disappointment with developers. It can cool the enthusiasm for applications with great potential like Google Calendar. With the launch of Google Calendar I hoped that it would fill one of my wishes for an easily shared online family calendar. So, I would not come home to an unexpected empty house or finding my kids hungry asking when and what I will cook for dinner. However, I have read that an API for Google Calendar is in the works. And that might be a way to open up Google Calendars so you connect to Google Calendars from other sites and applications in both directions, reading and writing events. That would proof that I am being pessimistic about this. But, still I think it is hard to believe that Google will provide such a full API. There would be no need for opening up the Calendar web application other than maybe have a look at your calendar away from your own home or work computer. But then again, you could probably just install Sunbird on a USB stick and take it with you anywhere you want. Bottom line is that Google with all good intentions I think they posses might be causing open source development by simply putting out such good near complete applications. Hmm. Maybe we should ask them to create less functional applications. Now that is a weird idea! there have been rumors about a calendar applications from Google for some weeks, months now. And yes, the rumors were true. 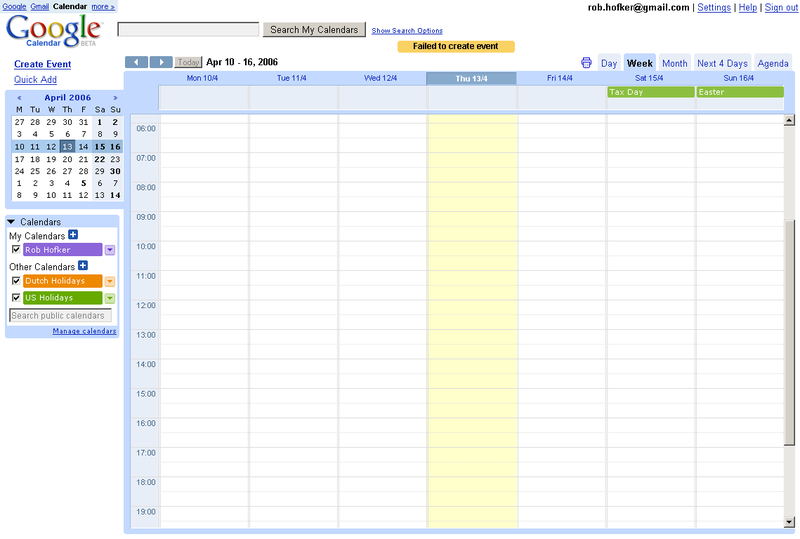 There is a Google Calendar live now! It seems that one of the things I miss is now available. Apparently I am again one of the many, many early adopters as it took a few attempts to get the calendar on screen. But that's the Internet and it could also be our nasty proxy server that hiccups occasionally. Eventually the Calendar is there. There is a lot to explore. Quite a lot. Well, I pretty soon found out that it is possible to import meetings from my Outlook calendar. So, I gave that a go. Nothing showed up. I added a calendar for my work related meetings and that never showed up. Hmmm? I must be doing something wrong. Adding other calendars is easy. I added the Dutch holidays calendar. I think it is far from complete. For instance Easter is missing. I added the US calendar and Easter is there. OK, that will hopefully fill up over time. I planned lunch. It showed up. I then lost it as I moved it to my invisible work calendar and it disappeared. Just see if I get an email reminder for lunch. I have added a couple of other events and it all works really intuitive. 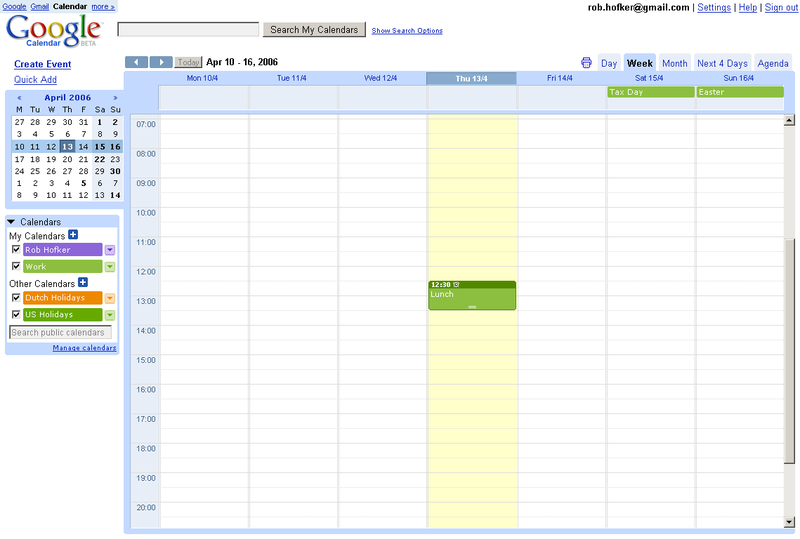 Click and drag in the calendar to select a time slot and away you are. Or use one the links in the upper left to create an event. But I have seen a lot of Failed to create event messages. I know, it is still beta and it might that another overwhelming crowd is trying simultaneously, but still this is not what I have come to expect from Google. I'll be back in a couple of days to have another look. Make an API available. I have no doubts this will happen quite soon. My guess is that it is in test right now. When this API is available have Sunbird connection. Heck, make Outlook connect to it. Finally, have my wife work with it so I know what and who awaits upon arrival back home. I just noticed that while writing this post Google Calendar has recovered. My lunch date is back and I now have two work calendars (yes, I tried twice). Makes me wonder where all my meetings from the Outlook import have gone. Maybe in a Google Calendar near you? Now we can run Windows XP on a Mac when we will be able to run OS X on a PC? If the first is possible why not the other? Bring on: Bootcamp for Windows ! With the now public beta of Boot Camp I am thinking that it is becoming increasing more likely that I will own an Apple computer in the near future. I have been eyeing the Mac Mini since it came out. Now with the ability to run the Windows XP OS and software on it The appeal has become very big indeed. Boot camp sure adds a lot of value to the Apple computers. Even though there are now some rumors that Boot Camp can lead to problems. But hey, it's a public BETA! .. but do I need them? In the second half of the 19th Century they thought that everything had been invented. Nothing new would appear. Since then planes were invented. The atomic bomb. Men went to the moon (Did they really?) The Internet came about. And useless gadgets. Men has progressed impressively since then. Now, at the start of another Century, Millennium even, we no longer believe everything has been invented. We have learned from history, it seems. We know that the more we know the less we know. Eh? We see enormous problems with this world (global warming, fossil fuel running out, diseases like aids and cancer) and scientists are working hard on all sorts of solutions. And humans have proved that usually they eventually will find a solution to a problem. So, not everything has been invented yet. But it's not just about finding solutions to existing problems. There will also be completely new stuff. Things we now think of as highly improbable will be turned into reality. In the coming years, decades many solutions to existing and non-existing problems will come to us. Inventions that we will not be able to live without although we do not have them at present. Look at the cell phone: many people can not leave home without it nowadays. Twenty years ago you could only haul one around if you were strong enough. Daily live will be impacted in ways we will only understand in retrospect. We will wonder: how could we have ever lived without the micro encapsalon player? All this progress that is looming at the horizon is wonderful. One day I will be old enough to say that I won't need all this modern stuff. But until then I say: "Let's make my life better"
There a quite a few things I sure can use in the coming years. Better: tomorrow. Best: today. Here's is a small list. It happens quite often that I arrive home after a day of hard work to find it empty. Wife and kids gone. Quick thinking tells me I haven't forgotten her birthday. A good look on the calendar and a quick Google of the back of my brain tells me that they are on a visit or to a sports club or something similar. Similarly it happens that I come home hoping to be able to plunge on the coach and be a perfect coach potato for the evening only to find out that I am supposed to go somewhere or entertain a boring salesperson in the evening. If I had only known this in advance! I could with fully synchronized PDAs and Outlook at work and home. I will be warned at work what awaits me at home.`This would make my home coming better. First there were coins. When you had quite a few of those you were loaded, heavy with copper and gold. Then came the paper bills. They were lighter and worth more. Great! Then they came up with plastic cards with could get you money (a step back again), but could also pay directly (a true step forward). And then there came credit cards, cards to access the building I work in, air miles cards, train cards. Nowadays I am loaded again with a multitude of plastic cards in my wallet. More cards then coins. I could sure use a solution that brings all this together into one thing. Something that is scanned automatically when I enter a building or a train and with which I can pay without bringing out my wallet. And I mean completely wireless. No strings attached, so to say. Think about your stereo and your 7-way surround sound system and the miles of cables that come along with them. Look at the back of your computer there are still quite a few power plugs and monitor cables and other string attached. Cut the wires and set me free. If you are really modern you remotely controlled curtains and lights added to your TV, DVD player and stereo. You will probably never find the correct remote and when you do you will have a hard time find out which button to press for the desired function. Make me an all in one remote with which I can easily pick the apparatus to control and then have the most appropriate options at my fingertips. And yes, there are more. Many more of life's little agonies that will be solved. And then in two, five or twenty years no one will ever understand what my problems are about. Then everyone will have a micro encapsalon player and can not imagine to have ever lived without it. Then living today seems like living in a cave. With all the overhype lately about Web 2.0 it is easy to remember the days of the Internet Bubble. In those days many had great little ideas that were then extrapolated into huge money makers. Everyone on this planet would want to own a Internet enabled cell phone that could be used to purchase lunch and coffee online from any location (Antartica included) and have it delivered at any time to their doorstep. Brick and mortar shops were doomed and with a year's time online online shops would be profitable. Well then the alarm clock went off and everyone woke up and got back to reality with a big bang. Only the Internet Boomers who sold their idea quick enough were the ones with money. All others were left behind. Most empty handed and empty pocketed. I must admit that I was thinking and thinking hard trying to find another great opportunity, but failed. Maybe all the better. After that a period of economic reconsideration came about. The air on which most of the companies were floating proved to be not volatile and some fell to the ground hard, while others made just a rough landing. It was the time of the 'delayed reality check'. People found out that if one liked some gadget you could not just multiply it with with world population and be rich instantaneous. It takes it bit more to reach that goal. Meanwhile, many of the great stuff that was invented during the Internet Bubble was not just thrown away. Lots and lots of developers and smart hobbyist gathered in small groups all over the Internet and discussed ideas. They created small applications, not big gazillion dollar profit machines, the e-perpetuum mobile of modern times. They believed in making smart open systems that others could work with. Applications that one can extend through APIs. Systems that leave a lot of room for the users to apply it in their own way for their own particular purpose. The best part they do not charge money for it. It is free. Sometimes they run ads on their service. But most of the time it is just a show case of what they can do. 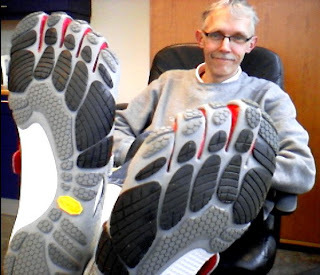 They are valuable freebies that make it clear to companies that the people behind are clever. Maybe they should hire these guys and girls to do some work. All these little clever applications popped up and got noticed through Digg, Del.icio.us, Furl and many others like that. Every once in a while a new app would pop up and become the next buzz on the social web. Web 2.0 was born. Nobody really knows the definition of Web 2.0 but that doesn't stop any one of being heated up about it. Web 2.0 would be make true where the Internet Bubble failed. At least that is the silent consensus. These small entrepreneurs are building real stuff. It is not vaporware. One can use it and extend it. And it is making money. We see things happening that happened not so long ago. Companies are buying these small startups for nice amounts of cash. Google has enormous amounts of cash through their IPO (sooo Internet Bubble like) and they are spending it on slurping up small startups and pushing forward all kinds of Open Source. It seems like the Internet is booming again. It is cool again to say that you are working in IT with things like AJAX and Web 2.0. It is cool to say that Web 2.0 is really Web 3.0 and you can get applause for that. It is even considered Web 2.0 to just write a blog. All this interest and hype is leading to over-enthusiasm and good money is thrown again to purchase small not yet mature products. It all sounds so familiar. Are these the days of the Internet Bubble 2.0? Are we clever humans making the same mistake again? Are we going to see loads and loads of millionaires that own only on paper. Are companies and people willing and eager to invest in vague ideas before any line of code has been written or a proof of concept exists? Time will tell. But looking at history people will usually make the same mistake multiple times before learning. If they ever learn, that is. But do not sit back and watch another Internet Bubble burst. Take action! I missed out on the first Bubble but I am not willing to miss out on the Second Internet Bubble. I am planning ideas and learning new stuff. Playing with AJAX. I have just installed Ruby. Heck! I am even blogging! Now, just mash up a great idea, get into the hype and then sell the lot to Google or someone else willing to pay. The whole idea about the next Internet Bubble is to get in while it is filling up with air and get out loaded before it bursts. Good luck!